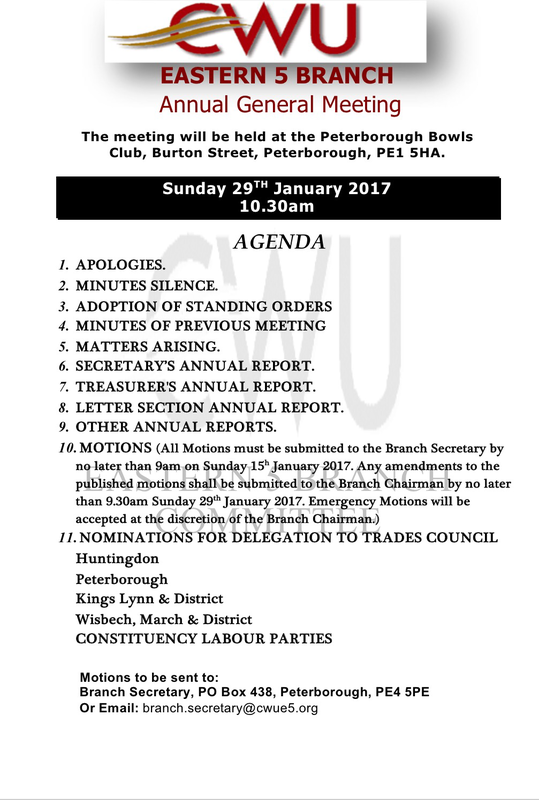 The meeting will be held at the Peterborough Bowls Club, Burton Street, Peterborough, PE1 5HA. On Sunday 29th January 2017 at 10.30am. All members are encouraged to attend. Further to LTB 740/16 I am pleased to report that following discussions between Royal Mail and CWU head office yesterday, members at Accrington Delivery Office voted to attend work at a gate meeting called by the East Lancs Amal Branch this morning. Royal Mail have in effect confirmed that the remaining issue from the Flashpoint Report of 24th August concerning the management of the office will be resolved in the New Year. The Accrington members have received tremendous support from Branches all around the country and there is no doubt that the solidarity shown has helped to bring the dispute to a successful resolution. The key factor was of course the unity, determination and discipline of the Accrington members. All enquiries regarding the content of this LTB should be addressed to the PTCS Department, quoting reference 412. I attach a document issued by Royal Mail to its managers entitled “Recognising good attendance” dated 16th December, received at head office from representatives in the field on 19th December. Contrary to the claim in the document the CWU was not briefed on the scheme nor was the union consulted on the attached document. The union was informed that Royal Mail intended to run an incentive scheme in the form of a prize draw. Last Friday, clearly after the attached brief had been drawn up and after copies of the December edition of The Courier which contains details of the scheme had gone to print, we were advised that the business intended to brief employees this week – no details of the scheme were shared. The union is opposed to any scheme which encourages members to attend work when they are not well enough to do so, or penalises people for being ill. We believe the scheme is an ill thought out, knee jerk return to the policies of a decade ago. It is extremely disappointing that the business has reverted to an unimaginative and self-defeating approach to the management of attendance which seeks to bypass the union. According to “The Courier” the intention is to “reinforce the message that our people have a vital part to play every day in delivering a great service to our customers”. Our members don’t need patronising messages of this kind, particularly at this time of year. Whatever the intention of the scheme, in reality, it will act as a further signal to managers that they must “get tough” on sickness absence. Despite this return to the sort of management behaviours in evidence before the introduction of the 2013 Attendance agreement, the level of sickness absence has continued to increase. The union has called for a joint and root and branch analysis of the underlying causes of this increase, which has taken place over the same period in which the number of reported bullying and harassment cases has increased by 52% and significant concerns about reasonable workload and aggressive management have been reported by staff in the company’s “Big Conversation” employee opinion exercise. Royal Mail has agreed to meet to discuss this in January. The union will positively engage to improve workplace morale and address some of the issues which we believe are driving the increase in sickness absence. This half-baked panic measure will not help. Branches should ensure that the Grievance Procedure and Industrial Relations Framework are used if managers abuse the contact strategy (the terms of which were jointly summarised by CWU and Royal Mail in LTB 691/2016) or if any of the other aggressive management behaviours and breaches of the Attendance Procedure listed in the bullet points above are encountered. All enquiries regarding the content of this LTB should be addressed to the PTCS Department, quoting reference 415. Attachment can be found in the attached LTB. Credential cards for delegates/visitors and voting cards for this conference will be issued on the Thursday morning at registration prior to the conference opening. All candidates for election to the TUC Women’s Conference must be women. All nominees require the nomination of their own Branch. The Keynote Speaker will be FRANCESCA MARTINEZ, a comedian, writer and respected social commentator. In 2014 she was named as one of Britain’s most influential women. The aim of the day is to increase involvement of women members in the CWU and the wider Labour movement. All women Representatives and Branch Women’s Officers are encouraged to attend and for them to bring as many CWU women members as possible. If you require any further information, please either contact Karen Bosson, North West Regional Women’s Secretary on 07894 423 892 or Carl Webb, Regional Secretary on 07850 019 602. The online registration system for registering delegates and observers to the above conference is now open. Please note that once a delegate has been registered correctly using the online registration system an agenda will be sent via the branch office, if time permits. There will also be a small amount of spare agendas available on a first come first served basis on the day of the conference.